Powerful: 10 levels of intensity for the right amount of relief. Multiple Users:Ideal for sharing with other family members. Each person should have their own pads. Easy To Travel With:Sturdy belt clip and soft carrying pouch for using anywhere, anytime. 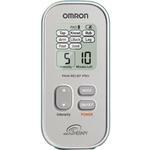 Limited Warranty Your OMRON Pain Relief Pro unit and electrode cords are warranted for 1 year, excluding the batteries. The pads supplied with the unit are warranted for 30 days. They are guaranteed to be free from defects in materials and workmanship if used in accordance with the instructions provided. The above warranties extend only to the original purchaser. We will, at our option, replace without charge, any unit covered by the above warranty. Replacement is our only responsibility and your only remedy under the above warranties. 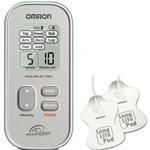 Omrons Long Life Pads are durable, comfortable and gently adhere to your skin. Exclusively used with the Omron electroTHERAPY Pain Relief (PM3030) unit, the electrode cords snap easily into place on to each pad. Tested in research and development laboratories, the Long Life Pads may be reusable up to 150 times or five months. The Long Life Pads can be placed on many different body parts, including lower back, joints (knees, elbows and ankles) arms, shoulders, legs, thigh, hips and feet. Always place the pad at least one inch apart on clean, dry, healthy skin of adults and do not share your pads.